Tall claims of the Municipal Corporation and the health department, Ludhiana, regarding awareness campaigns in different disease-prone areas fell flat today when the area residents denied these assertions saying that they only came across volunteers of pulse polio. 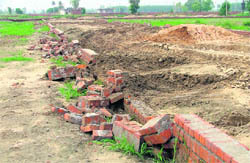 Having exhausted all other methods to make developers of unauthorised colonies fall in line and opt for regularisation as per the recent policy of the government, Greater Ludhiana Area Development Authority (GLADA) today swung into action and razed structures, boundary walls and other infrastructure in eight colonies under development in violation of the law on the periphery of the city. Twenty-five dark and dingy rooms in the residential areas of the city house 40 families. Commonly known as “vehras”, these small premises specially made for renting out migrants are mushrooming up frequently and there is no check on these. 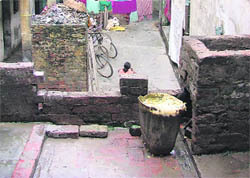 One can well imagine the unhygienic conditions in which people live here as these premises have enough rooms, but very few toilets. A resident welfare society has found a novel way to monitor their area round-the-clock. 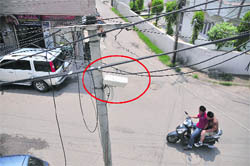 It has installed a few CCTV cameras in the locality to keep a check on criminal activities, snatchers and eve-teasers. The Sant Nagar Welfare Society has installed 16 cameras in its area with a hope to help the police in catching a suspect if any crime takes place. Unlike past years when resumption of normal study work used to take many days after holidays, government schoolteachers will be in full form on the very first working day after summer vacation on Friday. 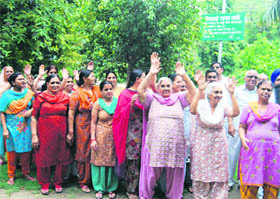 Teachers of 48 aided schools in Ludhiana have not been paid their salaries since January 2011. Tall claims of the education department to pay regular salaries to the teachers have fallen flat as around 700 teachers of these aided schools are yet to get their salaries. Despite tall claims the government could not repair the rest house here even 11 years after the PWD had declared it unsafe and recommended its demolition in 2000. The roof of the rest house is cracked at several places and a notice can be seen pasted on the walls of the rest house declaring the building unsafe. Furniture has also been lying in a shambles. 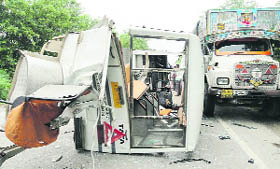 A woman worker of a spinning mill was killed and 18 others were injured on the Rahon-Machiwara road when a mini-bus of the mill they were travelling in collided with a stationary truck near Jharaudi village. Adhering to the All India Council of Technical Education (AICTE) norms regarding prevention and prohibition of ragging in technical institutions and universities, local institutions have started seeking affidavits from students that he/she was aware of the law regarding prohibition of ragging as well as the punishments and that he/she if found guilty of the offence was liable for punishment. The first round counselling of Guru Angad Dev Veterinary and Animal Sciences University (GADVASU) concluded for three undergraduate courses, including Bachelor of Veterinary Sciences & Animal Husbandry (five-year programme), Bachelor of Fisheries' Sciences (four-year programme) and Btech, dairy technology (four-year programme) at Silver Jubilee Block Auditorium of the university. Students of Guru Nanak National College, Doraha, have excelled the in the annual examinations conducted by Panjab University in April this year. Punjabi culture is known for its values. Serene music has been strength of our culture. It is a pity that the contemporary music is becoming a noise with undesirable elements intruding into it, said Tarlochan Singh, former chairman of the National Commission for Minority and Member of Parliament. The Excise and Taxation Department has suspended ETO Urvshi Goel, who was found guilty in helping a bogus firm. Amid tough resistance by shopkeepers, the Ludhiana Municipal Corporation officials finally removed encroachments from the busy Jail Road in Field Ganj area today. 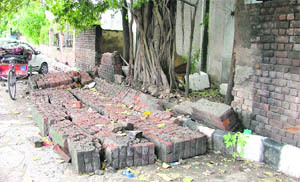 These encroachments were removed following the Punjab and Haryana High Court order. In today's drive, a total of 106 encroachments were removed, out of which seven shops were demolished. 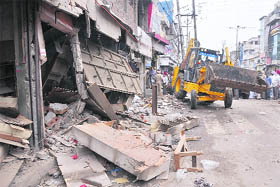 A ditch machine of the MC demolishes an illegal shop in the Field Ganj area in Ludhiana on Wednesday. After the infamous Indra Aawas Yojana scam, the ghost of the Shagun Scheme scam is haunting the district administration officials. There is ray of hope for the city bus service with officials of the Ludhiana Municipal Corporation holding talks with those of the Bathinda Development Authority (BDA) for procuring 10-low floor non air-conditioned buses. Stray dogs are not only endangering the lives of city residents but that of the livestock as well. In the latest incident, stray dogs entered an animal shed located near the railway line at Shaheed Bhagat Singh Nagar and bite nearly 15 sheep to death. Twenty others were killed in a stampede. Rising cost of quality education and failure to realise her dream of becoming an IPS officer proved too much to handle for a 20-year-girl, who allegedly committed suicide due to her family’s poor financial condition, in her house at Mundian village here yesterday. The controversy surrounding the construction of a disposal plant (pumping station) in a park in Kidwai Nagar seems to be getting murkier day by day. This disposal plant would be a part of the Janakpuri storm sewer project, which was inaugurated on May 23 by health minister Sat Pal Gosain and ever since the residents of Kidwai Nagar are objecting to it stating that it would destroy the beauty of their park and increase waterlogging woes of the area. In the wake of the arrival of monsoon in the region, and the hot and humid weather conditions being conducive for outbreak of several diseases, Deputy Commissioner Rahul Tiwari today directed executive officers of all municipal bodies and the health department to improve sanitation level. He also told them to take other necessary preventive measures against the outbreak of water-borne and vector-borne diseases. With the season’s showers hitting the region five days before its scheduled arrival on July 1, the weatherman has predicted a good monsoon this year also. Ludhiana district has already received 350 mm of rainfall till June 29 against the normal precipitation of 66 mm for the entire month. Nine candidates from among 16 in the fray for 10 seats of the Punjab Medical Council (PMC) have come together on commom platform to contest the polls jointly on the basis of a common agenda which promises to pursue an effective action plan to fight against quackery, safeguard the rights of doctors, save the medical professionals from harassment and promote academic programmes. Don’t let the rain ruin your fun. Do not compromise on style and leave the house dressed in your best. A woman falsified land records by declaring her mother-in-law dead in registry papers of a 22,600 square yard piece of land in Lohara in an attempt to usurp. However, her ploy misfired after Nachattar Kaur, 75, came to know of about her daughter-in-law’s deceit and informed the police about the fraud. In yet another crackdown on the flesh trade racket thriving in the city, SHO Kotwali Swapan Sharma raided at an alleged prostitution cantre in Mirado area and nabbed three couples in this connection.